This site is composed of entries from my blog over the spring and summer of 2016. The topic will introduce itself and needs no further explanation. As usual, I'm retaining the somewhat informal style of a blog entry, though I've removed most of the purely extraneous and personal content. This site is distributed over a number of pages, which are, of course, linked to each other. 1. Get out a calculator or some other mathematical device. Actually, this first point is not a requirement, but, unless you have an exceptional ability for doing calculations in your head, I'd like to suggest that you use some helpful instrument or app and keep track of what you're going to do with pencil and paper. 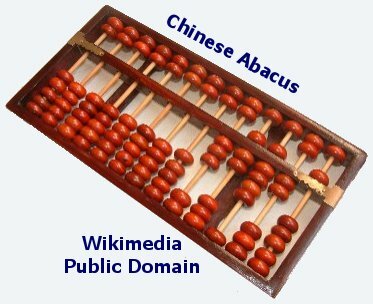 For all that I know, it may be possible to use an abacus for this procedure, but I, for one, would first have to learn how to manipulate one. Spreadsheets are ideal. As long as you insert the right formulas just once, they will do the calculations for you automatically. Then you can also play around with different starting numbers without redoing any of the work. 2. 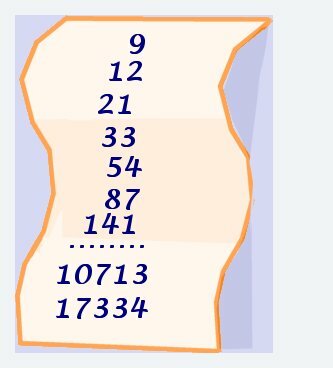 Pick a number, any number! I must warn you that it will probably be best if you start with some fairly low numbers, perhaps single digit integers, because we're going to do a lot of adding. I'm saying this only to keep things manageable. This "game" works to some extent with all rational numbers, including fractions and negatives. 3. Pick another number, any number! You may even use the same number again. I'm going to provide an example, and I'm picking the numbers 9 and 12. 4. Add your two numbers. E.g., the sum of my two numbers is 21. 5. You now have three numbers. Of those, add the last two. For my example, I have 9, 12, and 21. The sum of the last two is, of course, 33. 6. Go on with the process of adding the last two numbers step by step. E.g., I now add 21 and 33, to get 54. Then, in the next step, I will add 54 + 33 = 87, and so forth. 7. Do so for twenty numbers. I warned you: the size of the numbers will grow pretty quickly. 8. Now divide the 20th number by the 19th. E.g., I need to divide 17,334 by 10,713. I promise you that all of this is going to lead to some worthwhile thoughts with philosophical--and even theological-- impact. On a website, documentation is often done best by means of links, but every once in a while a note may seem in order. I will number the notes consecutively over the entire site, but house each one directly at the bottom of the section for which it is relevant. (1) I originally said "number magic," but it occurred to me that, since there are numerologists who would actually think of what follows in this series as being due to real mystical powers in numbers, I thought I'd better look for another term. Back to the text. So, did you do your additions and divisions as suggested on the last post? Did you come up with that strange number 1.61803 ...? If so, thanks for playing! But I need to take things one step further, in order to get to my motivation in writing this series. Are you aware of the fact that you were implementing a slightly altered version of a recursive function that yields the so-called Fibbonaci numbers? Don't worry if you haven't; I'm intending to explain this thing to you in this series. If so, good for you; I'd be interested to hear how you came across it. And is it common knowledge for you that 1:1.618 is often called the "Golden Ratio"? I shouldn't wonder, but I need to add a word of caution right here at the outset: On the one hand, it is of the nature of this number that its decimal places continue forever, so all numeric representations of it are going to be approximations. But that fact does not give us license to adapt it at our convenience. It's not the same as 1½ : 1 (1.5 ) or 1⅔ :1 (1.666 ....), though the latter is awfully close. Have you been taught that the Golden Ratio is derived from the Fibonacci series? I'm afraid that you may have been exposed to a widely held misconception. Finally, are you familiar with the idea that the "Golden Ratio" is supposed to evoke our deepest aesthetic sensitivity for what we label as beautiful? You may not like me after I said this, but the bona fide evidence for this very common notion may be based on a little bit of wishful thinking. So, you see that I have my work cut out for me. My intent is to clear up the confusion brought up by the last two questions. I have seen these ideas applied multiple times in the area of Christian apologetics and, thus, I believe that they should be corrected, lest we embarrass ourselves. It's going to take me a little time to bring up all of the necessary background so that I can make my point without simply throwing one dogmatic assertion against another, as Hegel might say. So, in order to get to my destination clearly and plausibly, you'll have to follow me through a few back roads. I don't want to overestimate the impact of my writing, but it would be wonderful if some issues, such as this one, would receive more precise treatment. 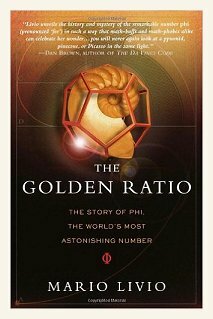 The book to which I made reference in the last entry is Mario Livio, The Golden Ratio: The Story of Phi, the World's Most Astonishing Number (New York: Broadway Books, 2002). I will return to it for a lot of detailed information in a while. Before going on, let me clarify that I'm going to lapse into anthropomorphisms from time to time, talking about numbers as though they were personal causal agents. Please understand that doing so is pure whimsy on my part, and that I do not ascribe any powers to numbers beyond their mathematical contexts. For example, I don't do Gematria or think of numbers as good or bad. Numerology, it seems to me, becomes impossible once you realize that different cultures have differing number systems as well as mutually exclusive ideas about the "deeper" meanings of numbers. A number that is considered auspicious in one culture, may be thought of as potentially harmful in another, provided that it is even expressible there. In general, of course, one could say that one system is the true one, whereas the others are mistaken. But there is no standard to measure the truth of something that's supposed to be beyond reason and logic, and no contradiction can ever be true. Over the last dozen years or so, I have become increasingly fascinated by the beauty of numbers, which I believe to be God's creations. Each one has its own properties; no two of them are alike. --- Okay, I know there's not a whole lot of profundity in that observation as it stands. Come to think of it, there isn't any. --- However, I'm thinking beyond mere tautologies, e.g., not just that 1 is not 2, etc. I'm also including the special attributes that come with each number, which you may not pick up on until you have spent some time in their company. For example, look at all the things that our friend Zero can do (and, for that matter, what she's not suited for) . We will definitely miss out on Zero's charm if we merely think of her as "nothing." Some writers, such as Charles Seife2, claim that the early Greeks would not recognize a concept such as Zero because doing so would imply treating nothing as something. There is some truth to that claim for, say, Parmenides, but such a far-flung statement clearly overgeneralizes. Alas, the grammars of IndoEuropean languages with which I am familiar make it unavoidable to speak of "nothing" as though it were an object. Still, even though it doesn't make sense to say that "non-being exists" (i.e. that it has being), that fact doesn't imply that it has no reality. It may not exist in the same way as pumpkins or spiders do, but it can certainly be real. If you open your refrigerator in order to get some food, and it's empty, you're confronted by something real, even though what is real is the absence (or privation) of food. So, it is certainly appropriate that in the process of making an inventory of objects, we usually record the absence of something by labeling it with a "0." But that's only one attribute of Zero. Zero is a place holder in our system of numbers. I've mentioned different systems before, and I'll just refer you to a collection of some of those entries. The point at hand is that in our Indian/Arabic numbering system there's a big difference between the numbers 54 and 504. In the case of the second number, the presence of Zero between the ciphers 5 and 4 has added 450 units to the number. She's telling us that the column of 10s is not represented in the numeral, which is a far cry from thinking of her as just "nothing." Moving on, we call on Zero to express "additive identity." 12 + 0 = 12. We're adding Zero to 12 and still have the same old 12. In fact, Zero does this for every number. It assures us that, if added to any number, the number remains identical to what it was before the addition. --- "Big deal," you say. "That's just playing word games." --- "Not quite," I must reply. Think of how this property works out in, say, an algebraic equation. Let's say that you're multiplying two polynomials, e.g., (x+10) and (x-10). Furthermore, we know that 10x -10x=0. Now we're definitely not fussing around with "nothing" when we recognize that the presence of 0 will not affect the identity of the rest of the formula, allowing us to eliminate Zero safely, viz. without having to maintain either "10x-10x" or "0" in our thoughts or on our papers. If you want to get to know the real Zero, in the long run it will be better to think of her as representing "additive identity" rather than as "nothing." In the kingdom of multiplication, Queen Zero rules! Wherever she appears in a product, she takes total control, regardless of how many other factors are present or how large they are. The number of hydrogen molecules in the universe is equal to the number of moons circling the earth, once they have both been multiplied by Her Majesty Queen Zero. On the other hand, in the adjoining land of division, Zero plays the part of an obstreperous brat. Either we give her everything (which we are not about to do), or she won't play at all. One could make use of the sleight of hand that mathematicians call "approaching the limit" to argue that any number divided by zero yields infinity, and I must state for the record that a feat along such lines is fundamental to the theory behind calculus. However, in the usual arithmetical sense, dividing by zero is not just something that you should not do, but something that you cannot do. I mean, can one even conceive of what dividing by zero means? I'll stop here with my observations on Zero. We could go on in the same way, sliding up to 1, and we would find out some really entertaining properties for that number. The same goes for 2, as well as for 3, 4, 5, and really "everyone" else present at our little party for numbers. But we'll postpone such ruminations for now and try to get back to 1.61803... Here is a number that's not only unique in an obvious sense, but that's downright eccentric. (2) Charles Seife, Zero: The Biography of a Dangerous Idea (New York: Penguin, 2000) This book has some good points, but is rife with the common set of false negative stereotypes concerning Greek philosophy, the Middle Ages, Aristotle's standing in the Middle Ages, the Church, and whatever else continues to play up to contemporary pretentiously uninformed audiences. Back to the text. Here is a diagram of the different kinds of numbers ℕ, ℤ, ℚ, ℝ, and ℂ that I will describe here. The prime numbers, ℙ, are included within ℕ, but should not be displayed in a diagram such as this one because they are one of two parallel option, and not fundamental to all members of ℕ . For me this is the kind of memory aid that I can get myself to remember after I recalled the sequence of N, Z, Q, R, and C. So, it isn't a of much help for me, but perhaps it may be of use for other people. And, just to prevent any misunderstandings, in the usual manner of mnemonics, it's a little bit of nonsense. To the best of my knowledge, there has never been an African potentate in East Asia, male or female. ℕ� ℕ� is the set of all natural numbers, the ones we use to count. It does not include fractions or negative numbers. They are the whole numbers that begin with 1 and stretch to infinity. "Infinity" should not be construed as a number; the term simply designates a set of a never ending chain of numbers, and it should also be understood separately from the metaphysical concept of infinity, which we apply to God in the sense that his attributes are limitless. There are two kinds of numbers among the multitude in the ℕ� circle: those that are prime and those that are not. Prime numbers are those numbers that cannot be divided without remainder by anything other than 1 (which is trivial) and themselves (which is given). Any prime number divided by an integer other than 1 or itself is going to leave a fraction. For example 61 divided by 1 is 61 and divided by itself is 1, but if you try to divide it by any other whole number, you get a fraction. The prime numbers are a subset of ℕ and can be given their own designation, ℙ. 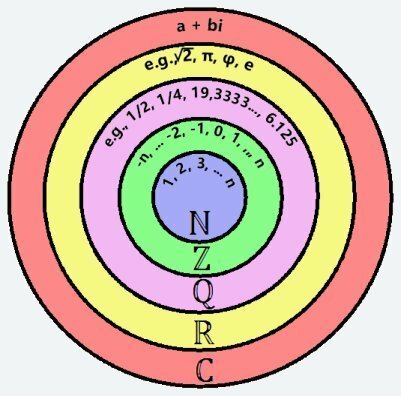 However, they are really a different kind of thing from the other classes of numbers here because they have a non-inclusive counterpart in the numbers that are not prime and are, therefore, not just one more ring at the center of the circle diagram. ℙPrime numbers have given rise to numerous interesting insights, guesses, and speculations.There are two particular problems that have a high profile at this time. No one has been able provide a proof or disproof for either of them. Perhaps the more famous of the two is the famous Riemann Hypothesis, which is concerned with the distribution and density of prime numbers on the number line. Further along on this site, when there's at least a tangential excuse to mention it, I will give a very short description of it. The other is the Goldbach Conjecture. If it is true, then it is possible to express every even integer as the sum of two prime numbers, e.g. 4=3+1; 32=19+13, etc. There is a prize of 1 million dollars waiting for whoever comes up with either a proof or a disproof of them. Serious mathematicians have been joined by seekers of fame and fortune, not to mention crackpots, to come up with a definitive answer, so far probably unsuccessfully. I'm saying "probably" because, who knows? Maybe someone has figured it out, but his or her success has not yet been recognized. People who are aware of their limits, as exemplified by your bloggist, may know enough to understand the problems, but are also too smart to imagine that they could come even close to a proof if they tried. For that matter, if I came up with a proof here in the isolated comfort of Smalltown, USA, I wouldn't know what to do with it. Who would listen to me or take me seriously? I suppose I would have to post it on Twitter in order to get anyone to see it. Then 13,569 people would insist that they had it first, and I would have to share my million dollars with them, and each of us would get exactly $36.85 after taxes. It might surprise you, as it did me, to know that negative numbers are a relatively recent addition to what mathematicians on the whole accept as legitimate. As late as the seventeenth century well-known mathematicians, such as Blaise Pascal dismissed them as "nonsense." Rene Descartes approved of negative numbers only as long as they could be transformed into positive ones. Thus, if we are looking for the square roots of 1, we would say that there are two correct solutions: 1 and -1, but Descartes wanted to strike the -1, because in its unaltered state -1 is not a true number. However, he allowed the use of negative numbers in intermediate stages that will arrive at a positive number, e.g., -4 x -7 = 28. Even in the eighteenth century, Gottfried Leibniz, the inventor of calculus as we know it, was hesitant about the use of negative numbers. Leonhard Euler (pronounced "Oiler," not "Yooler"), one of the top ten mathematicians of all times, maybe even one of the top five, still felt the need to justify their use by drawing an analogy representing them as a kind of "debt." Thus, even though ℤ is situated logically between ℕ and the next category, ℚ, historically ℤ was accepted universally only about two thousand years after ℚ.
ℚ The letter ℚ is based on the word Quotient, which is also an English word, but is used in German much more commonly for the result of a division problem, similarly to the ease with which we use "sum" and "product" for addition and multiplication respectively. We call its occupants the "rational" numbers. This class contains all of the numbers that can be expressed as fractions without any unspecifiable remainders hanging around. Clearly any member of ℤ is included in ℚ, since any whole number can be expressed as a fraction. E.g., 17 is equal to 17/1 or--perhaps a little more meaningfully--51/3. Negative integers, who lend their distinctive flavor to ℤ are also included in ℚ, though we must be careful with our signs. -17 is not equal to -51/-3 (that would come out as the positive 17). To maintain the negative sign we need to make sure that the numerator and denominator are of opposite signs (one positive, one negative). What we are adding in ℚ are all of the neat fractions that consist of integers for both the numerator and denominator. If divided out as decimals, they eventually come to an end or wind up with a predictable repetition of a number or a group of numbers. 1/2, 25/8, 256/3, and 22/7 are rational numbers. 1/2 written in decimal form is 0.5..
25/8 yields 3.125. The remainder is 3 places long, but that's where it comes to a halt. 256/3 expressed as a decimal, never comes to an end. It decimal form is 85.33333333 .... However, because there will be nothing but 3's in its future, it's a bona fide member of the club of rational numbers. This property, called "periodicity," also applies to ever-repeating groups of numbers. 22/7 is frequently used as an approximation for pi. If we divide out this fraction we get 3.142857142857142857. The sequence of 142857 will endlessly repeat itself, and, consequently this approximation is also a rational number, unlike pi, where the decimals continue to roll on and on without pattern. And, of course, even without doing the decimal calculation, all of these numbers are already pre-qualified as rational because they are fractions with integers at both the top and the bottom. ℝ The next group is ℝ, where ℝ stands for "real." Resist the temptation to think of ℝ as standing for "rational." The rational numbers are already accommodated by ℚ. So, what ℝ brings to the party is all of the irrational numbers, of which there are more than rational ones, according to Georg Cantor and modern set theory. Now, you may think of mathematics as the ultimate exercise in rationality and be somewhat befuddled as to how there could be "irrational" numbers. Well, these numbers are not "irrational" in the sense that they are contradictory or derived from some mystical intuition. They are "irrational" in the sense that they do not fit into the nice and tidy collection of numbers in ℚ that can be expressed as a fraction of two integers or that, as a decimal, ever reaches a conclusion. To clarify the second point, an irrational number's decimal fractions neither come to an end point nor assume a pattern, such as the repetition of 3's we saw earlier, or even the repetition of an identical set of several numbers following division by 7. ℂ Finally, there is ℂ, which adds the so-called imaginary numbers, or, much better, complex numbers (hence its letter designation). They do not play a big role in our present discussion on ϕ, but I'm bringing them up because it doesn't make any sense to list all of the others and leave out this last one, and we will mention them a few times as asides. Above I mentioned in passing that the number 1 has two square roots, namely 1 and -1. Each of those two numbers multiplied by themselves yields 1. So what would be the square root of -1? It obviously cannot be either -1 or 1 because they give us 1, not -1. I guess one could try to sneak in the notion that a square root could consist of one positive and one negative number, but doing so would fly in the face of what we mean by "square root," namely a number that gives us a result when it is multiplied by itself. -1 and 1 are clearly not the same number. So, let's just stipulate that there is such a number, and we'll call it i, for "imaginary," not "irrational," since the irrational numbers were already allocated their place in ℝ. Philosophically, one can debate whether i is any more or less imaginary than, say, -243; some folks might say that they are equally imaginary. Others, among them your bloggist, would endow them with the same reality as all other numbers. Regardless, with i having achieved acceptance, there are even more kinds of numbers. And, not-so by the way, since their first appearance in mathematics, "imaginary" numbers have also become useful in physics. It is possible, even desirable, to combine real and imaginary numbers. But you can only do so with the same style that you would apply to a polynomial, viz. to state them as a real number plus or minus so many i, e.g., 3+2i or 37+8i. The number "line" has become a "plane" if we want to have any hope of graphing these numbers. These combinations of real and imaginary numbers gives them the appropriate label of "complex" numbers. As with all previous classes, ℂ 's circle includes all other numbers. Those numbers that do not have a need a direct reference to i could all be rewritten as n+0i." Let me get back to phi now with a final comment for tonight. This number, which we shall treat in its own right eventually, does not appear in our concentric circles until we get to ℝ, the real numbers. It is neither a counting number, nor an integer in the larger sense, nor a rational number. As we described above, that means that any expression of it as a proper fraction is only an approximation, and, for that matter, any expression of it as a decimal number is also only an approximation, though it has been calculated to thousands of places. This is one of the ways in which phi and pi resemble each other. (3) There is also a significant difference between ϕ and π. Pi is a "transcendental" number, which means that it cannot be derived from an algebraic formula. Phi does not share that property, and we'll be able to express it as an equation, namely x2–x–1=0 . Back to the text. I left off by saying that the number that is the subject of our attention, namely ϕ (= 1.61803…) belongs to the category of the “irrational numbers,” which, together with counting numbers (ℕ ), integers (ℤ) and the rational numbers (ℚ) make up the set of so-called real numbers (ℝ). These irrational numbers received that label because they did not fit into the way in which the early Greek mathematicians, particularly Pythagoras, attempted to envision the numerical regularity of the universe. Pythagoras is known, among many other things, for his discovery of the linkage between numbers and music. Some people hold it against him that he supposedly mechanized the beauty of music by imposing his mathematical system on it. However, Pythagoras did nothing of the kind. He did not impose anything; he discovered that the sounds that we consider to be pleasing follow some simple numerical patterns. The music came first; Pythagoras found the numbers that appeared to be hidden in it. Pythagoras and his followers were rather pleased with the notion that the universe could be described with ratios of whole numbers, the “rational” numbers. Now, somewhere, somehow, someone discovered that it was not so; there were numbers for which it was impossible to represent them accurately as whole-number ratios. There are many legends connected to the intrusion of irrational numbers into the beautiful harmony of the Pythagorean system. Some of them blame one of his followers named Hippasos and go so far as to say that Pythagoras ordered his execution and had his minions swear an oath that they should never ever reveal the existence of this alleged heresy. The most we can document with reasonable assurance is that, somewhere around the time when Pythagoras flourished, someone discovered irrational numbers, and Pythagoras presumably did not much care for this idea.